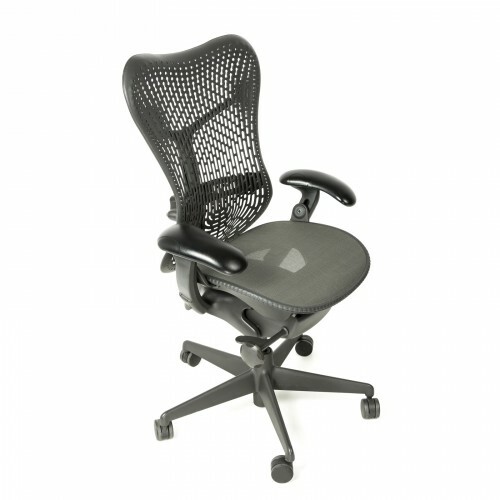 Introduced by Herman Miller as their next generation innovative ergonomic office chair after disrupting the market with the Aeron Chair, the Herman Miller Mirra chair has been winning awards since 2003 and for good reason. 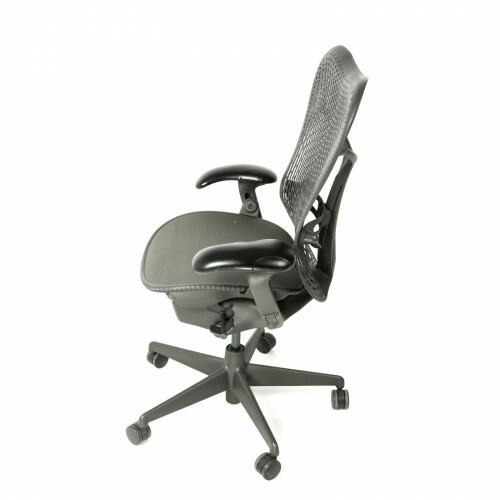 The Mirra’s combination of modern, sleek design and high performance across all ergonomic metrics has established the Mirra as an extremely popular office chair for individuals and companies across a wide range of industries. The Mirra’s perforated polymer backrest provides both stability and flexibility, while the AirWeave suspension seat helps dissipate heat while distributing body weight evenly for a natural and well-balanced experience. The Mirra is also one of the most eco-friendly chairs in the marketplace: made from 42% recycled materials, 96% of the chair is recyclable when it reaches the end of its useful life. 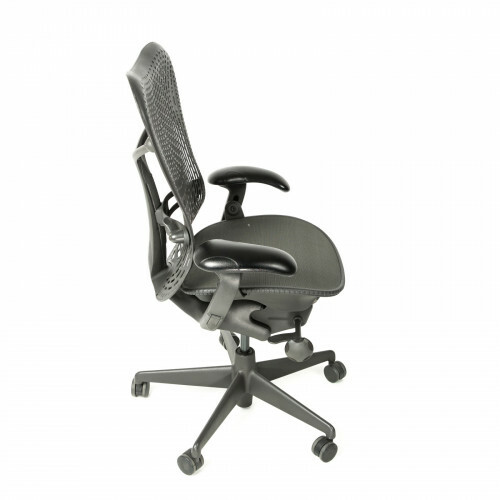 While not as popular as the Aeron chair because it is not as well known, the Mirra has developed a cult following largely due to its unique comfort and support, as is the chair most members of our team at Beverly Hills Chairs use at our office. While the Mirra is known to be an expensive chair because of its supreme performance and innovative design, customers can enjoy the Mirra and its full suite of ergonomic features at deeply discounted pricing through Beverly Hills Chairs. PLEASE CALL US FOR OPTIONS ON SELECT COLORS AS OUR COLOR SELECTION VARIES AND IS SUBJECT TO CHANGE. *Chairs are available in Fog Blue, Black, and Black Fabric. Colors are subject to availability. *The mesh on Mirra seats is in excellent condition functionally but may have slight discoloration. All of our Herman Miller chairs are backed with a Free Lifetime Warranty. See Terms and Conditions for warranty details. The people who work at Beverly Hills Chairs are so helpful. They helped me pick out the right chair and they even offered to deliver my chair to my house. I was very impressed with their customer service. I truly felt like a valued customer. Appearances mean a lot to me. As I was setting up my home office, I searched for a chair to match my decor. Guests always say that my loft looks like an office: gray-white walls and similarly-colored furniture. I like that look, so naturally, I'd want an office chair that matches. 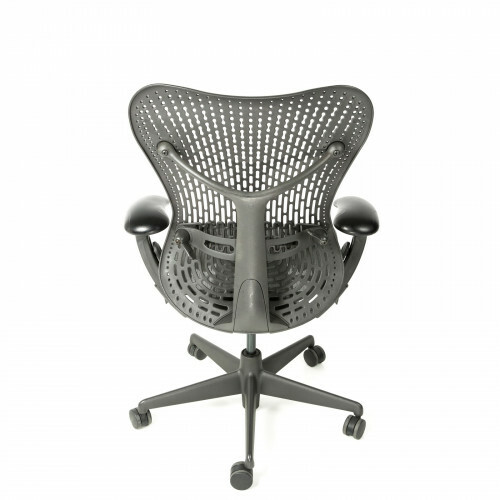 When I saw this graphite-colored Herman Miller Mirra office chair, I had to have it. I'm a video editor for an independent production company here in L.A. Between features, commercials, shorts, etc., I'm sitting all day, every day. having the right equipment is imperative. That includes having the right chair to sit in. I heard that Herman Miller Mirra office chairs are great for long-term sitting. When I realized that this Mirra chair comes equipped with PostureFit, I had to try it for myself. I had my Mirra chair delivered from Beverly Hills Chairs and I'm super pleased with my purchase. If you buy this office chair, I can guarantee you won't regret it. When I ordered an office chair through a vendor at work, I realized that it wasn't as comfortable as I thought it would be. There was very little back support, the armrests didn't fit under my desk so I couldn't sit as close as I wanted, and the chair never stayed at the height I wanted. Had I known that I could go down to Beverly Hills Chairs' office and try out their Herman Miller chairs, I could've saved myself the trouble of having to send my old chair back. Regardless, I purchased my Herman Miller Mirra from BHC and I have no regrets. I recently got a promotion at work. With the extra money I got, I was able to afford a new office chair for my home office. I decided to check out the Herman Miller Mirra chair at Beverly Hills Chairs. What a bargain! I love my new Mirra chair. If you're looking for an office chair, shop here.